Are you a fan of Apple technology...? Did you know that earlier this year when they released the Smart Apple Watch, a Watch App which has the ability to control a users hearing aid device was also released? The power of controlling a hearing aid device via a Watch screen is here. ReSound has introduced the first Hearing Aid App to the market, which has been specifically designed for the Apple Watch. We believe everyone who depends on a hearing loss device should be able to control it easily with simple remote access and adjust settings throughout different daily scenarios. Apple Watch Apps are available to all Apple Watch wearers instantly, via a simple download. 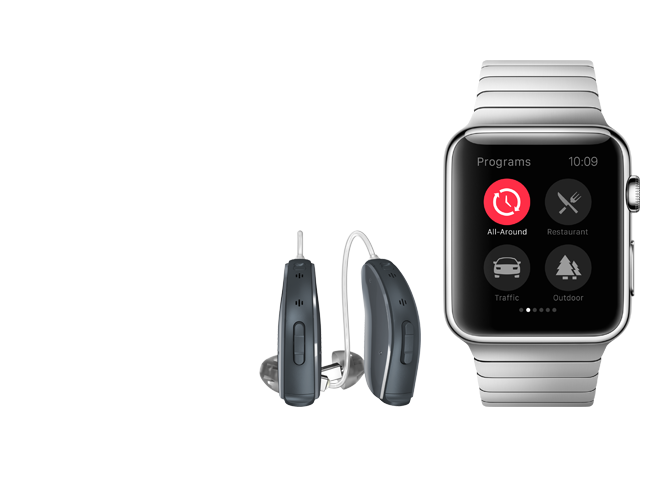 The ReSound Smart App for the Apple Watch is intended to bring more connectivity options to smart hearing aids. The App is available via the App Store, simply ensure you download the latest version of the ReSound Smart App and keep it regularly updated. Digital hearing aids have enabled users to experience a multitude of sounds and pitches, via the process of breaking down incoming sound signals into digital information (algorithms) which are individually processed. The developments since analogue hearing aids into the digital world, have continued to advance globally. ReSound want users to take advantage of seamless, on-the-go control, right from their wrists. They have stated how their Smart App signifies their efforts to bring forward-looking solutions to users who wish to take control of their hearing loss further. They believe hearing loss will not be an issue in the future and will not prevent a user from gaining a natural hearing experience. ReSound has introduced the ReSound Smart app for Apple Watch which allows users to take advantage of seamless, on-the-go control, right from their wrist. ReSound will continue to work on technology advances, revolutionizing hearing aid control and the personalization of hearing aid devices. The Smart Apple Watch App enables users to set preferred preferences, such as volume, treble, bass and audio profiles for different sound environments. Some ReSounds hearing aid models also allow users to gain easy access to sound enhancer controls for comfort in noisy or windy environments. So if you need to view at-a-glance the details about your hearing aid, the Apple Smart Watch and ReSound Watch App maybe the best solution for you.